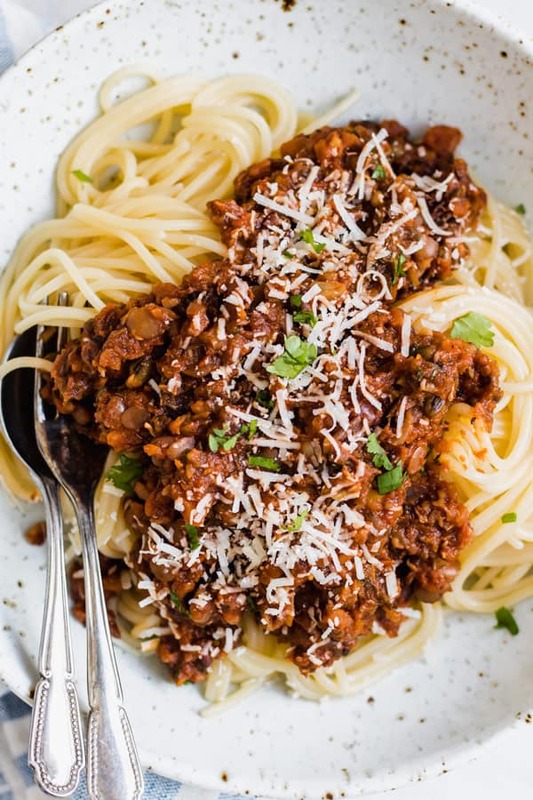 This comforting lentil bolognese is the ultimate healthy comfort food. It’s loaded with veggies and lentils and can be enjoyed on your favorite pasta, spaghetti squash, or even on its own! This is it. 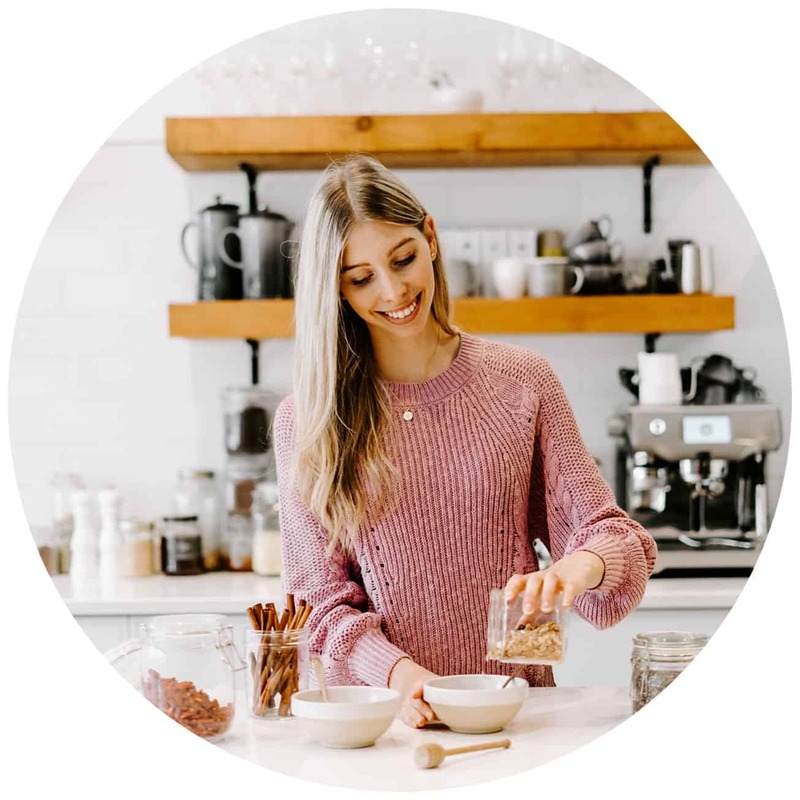 the ultimate healthy comfort food! 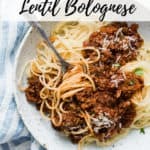 I don’t know about you, but with the crazy winter weather all I’ve been wanting to do is curl up and enjoy warm and cozy foods, like this comforting lentil bolognese! So I decided what better to do on a freezing rainy night when I’m trapped at home than create a cozy dish that warms the soul. 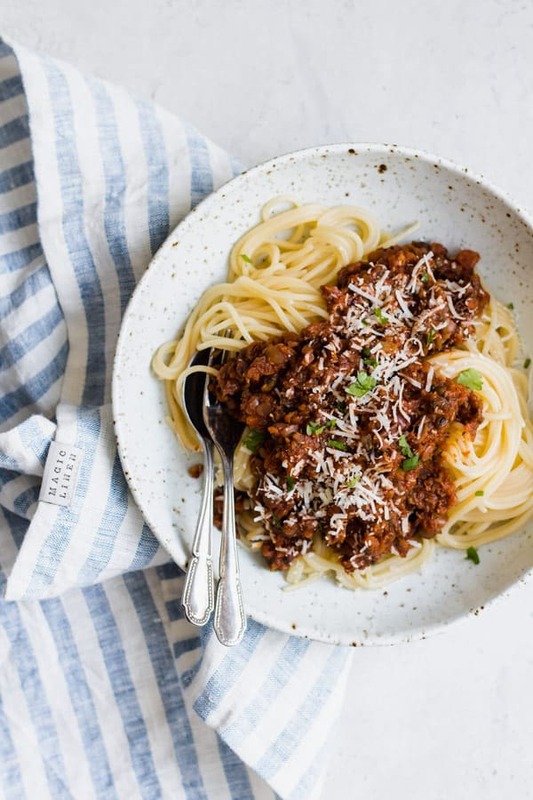 This comforting lentil bolognese is one of those dishes that just takes time. 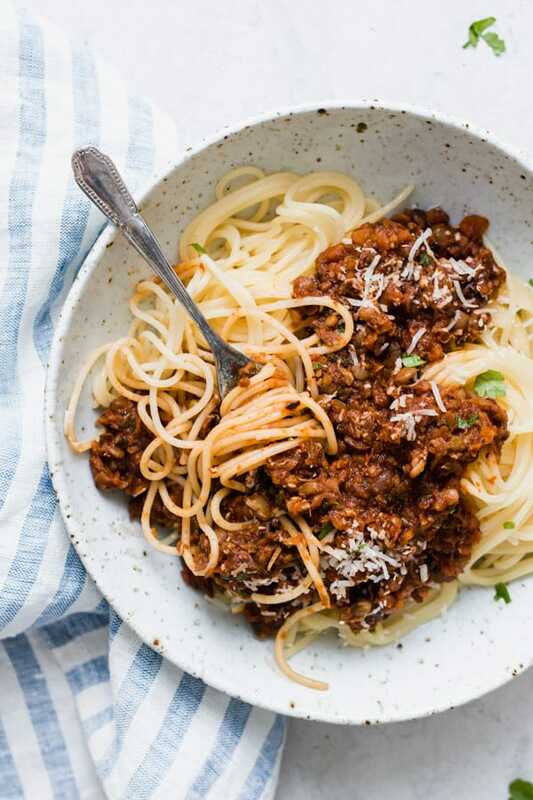 Time is actually the secret ingredient that makes a bolognese taste so delicious. It allows all the flavors to really come out and creates a sauce that is just so damn good. 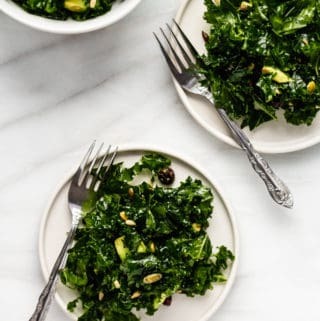 The good news is since you’re going to have to open a bottle of red wine anyways for this recipe, you can put on some music, pour yourself a glass, and relax in the kitchen while you cook! 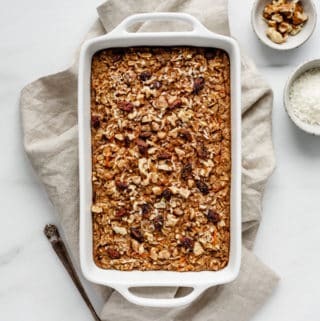 Another thing I love about this recipe is that you can make it a day (or a few days) in advance and store it in the fridge so it’s ready to go when dinner comes around. 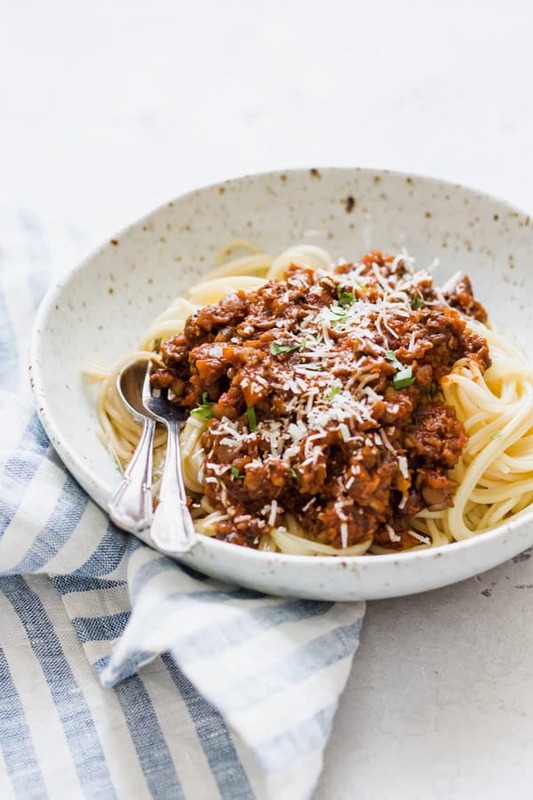 A delicious and hearty vegan bolognese loaded with veggies! Add the onion, garlic, carrots, celery, mushroom, and pepper to a food processor and chop into small bits. Heat the oil in a pan on medium-high heat and add in the chopped vegetables and salt. Once the vegetables are browned, add in the wine. Cook on medium heat until the wine evaporates. Next, add in the lentils, and crushed tomatoes, and the rest of the seasoning and mix together until well combined. Lower the heat to low, add in the water and let cook down for another 20 minutes. 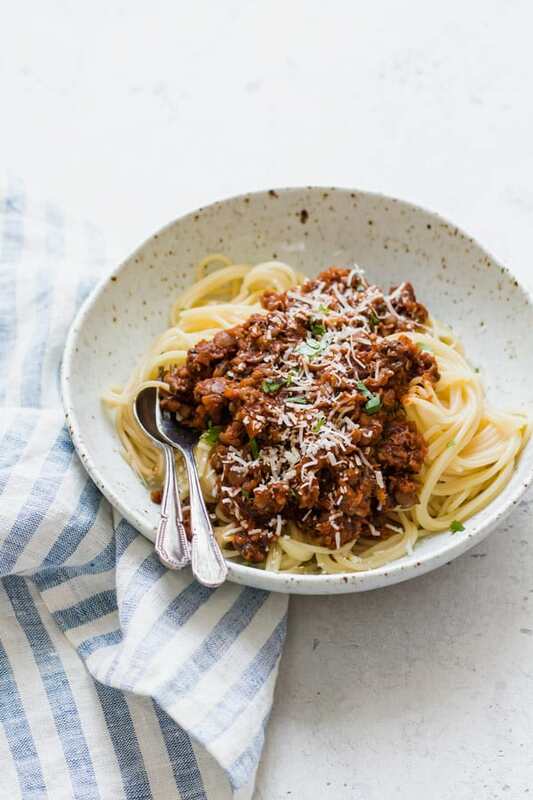 Serve over your favorite spaghetti or pasta. 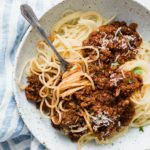 If you love this comforting lentil bolognese you’ll also love this creamy vegan roasted red pepper pasta! I totally understand. I don’t really cook much with “fake meats.” I definitely prefer the natural textures and flavors of the lentils and mushrooms in this recipe. I hope you like it too! I’ve got this recipe simmering as we speak. It smells great and will be nice way to get the kids to eat more veggies! Hi Myriam, yum! 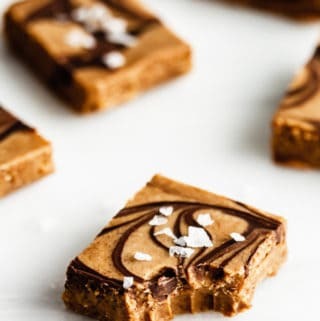 I hope you and your kids enjoy the recipe!